Big Daddy's House started a topic Meatballs. I like to use rotini in baked pasta instead of ziti. Rotini is one of my favorites. Good for casseroles. I made meatballs and sauce last week. I made enough meatballs for 2 meals (4 servings each meal) and enough sauce (without meat) to put in freezer. I have 5 pints of sauce frozen and waiting to go. I tried Ronzoni Quick Cook Rotini. It cooks in exactly 3 minutes perfectly. They are skinny short corkscrews. I will use them again. You guys got me wanting spaghetti & meatballs or meat sauce now! I may do it next week. Hah! Chipotle chiles are jalapeño peppers that have been smoked and dried. They are often served in an adobo sauce made with chiles, garlic, vinegar, onions and tomatoes. We came across this recipe for Chipotle Meatballs recently in the New York Times (a corrected version of the recipe) and it sounded so good we gave it a whirl. The verdict? Excellent! Particularly good served with plain rice or tortillas. Quite spicy, best accompanied by something cool - sour cream, salad. It has been added to our list of new favorites. 1 Heat oven to 450 degrees. In a food processor, combine bacon and 1 garlic clove. Process until finely chopped. Add eggs, bread crumbs and 1 teaspoon salt. Pulse several times to combine thoroughly, then add pork and mint. Pulse a few more times until well combined but not a paste. Remove meat from processor. 2 With wet hands, form meat into about 16 plum-size balls and space them out in a 13-by-9-inch baking dish. Bake until lightly browned, about 15 minutes. 3 While meatballs bake, combine tomatoes, ¼ cup tomato juice, chipotles, 1 to 2 tablespoons chipotle sauce, oregano, remaining garlic cloves (cut in half) and ½ teaspoon salt in a blender or food processor. Process to a smooth purée. 4 When meatballs are ready, spoon off rendered fat from baking dish, then pour tomato mixture on top, covering meatballs evenly. Bake until sauce has thickened somewhat, 15 to 20 minutes. 5 Heat broth in a small saucepan. Divide meatballs among four dinner plates, leaving sauce behind. Stir enough broth into sauce to give it a spoonable consistency. Taste and season with salt, if necessary. Spoon sauce over meatballs, decorate with extra mint leaves, if you wish, and serve. 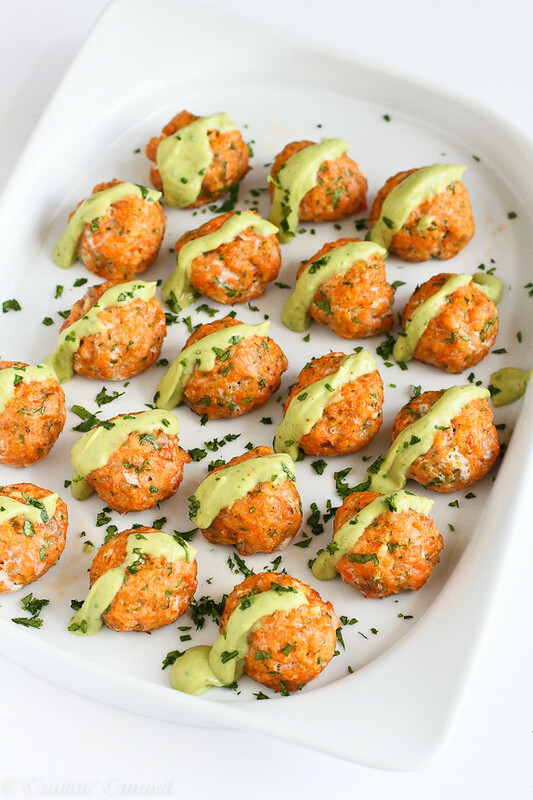 I fell in love cooking this Baked Salmon Meatballs with Creamy Avocado! It's so refreshing and delicious! Thanks for the reccipes. Now I want meatballs. mmmmmmm. It is not that complicated if you know how to do it. I just made a meat loaf yesterday. Haha. Nothing is complicated if you know how to do it. But I am sure after a few attempts it will be easy. wow. meatballs are much more complex than I anticipated. nonetheless I should try it. by the way it is lovely how you use the "hungarian paprika" term. (sorry I actually did not believe that our paprika is really famous. I thought it is just "World famous in Hungary" like many of our products) So, do you use paprika ground, dried paprika or maybe fresh? And maybe I would use a combination of black and white pepper since the flavor of the cayenne is too much similar to paprika, IMO. I should try this! I love meatballs ! Your recipe sounds very appetizing and yummy. I will sure give it a try next weekend as I will have friends over for a dinner party. Let us know what recipe you use and how they turned out.